Before Mayor Chris Spearman convened Monday afternoon’s council meeting with the regular cast, he had some visitors taking the top seats at city hall. 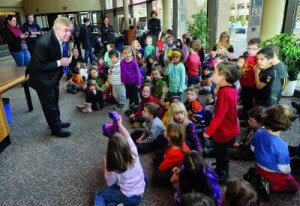 A group of about 50 children, age 3 to age 5 from the Lethbridge Montessori School, met with the mayor as part of National Child Day. The celebration day was actually last Thursday, but since Spearman was in Calgary for the municipal government conference, the event took place Monday morning. Many of the children walked to city hall, both to showcase the health benefits and to show their presence in the community. They were also excited to see the inside of city hall and meet the mayor, said Zahra Foroud, director and principal for the Lethbridge Montessori School. “Education is a big thing that brings us here to where the decision makers are,” she said. The kids asked Spearman questions and he told them about the city’s parks, safety and services, in addition to showing them the council chambers. “Being newly elected, it’s a lot of fun to see people who are enthusiastic,” Spearman said. The Montessori students also told the mayor about raising money for relief efforts to the Philippines, as each of the 160 children, between the two campuses, was asked to bring one dollar. One child even brought in their entire piggy bank contents of $30.05 and the school will now match the students’ collective money. “This is the best time for children to learn empathy and also learn to be generous and be aware of the needs of others in other countries,” Foroud said. A humourous moment occurred when Spearman showed the children how the council chambers’ microphone system works. It didn’t take long for one of the students to turn one of them on and start yelling into it, much to the delight of his classmates. “Just like a real council meeting,” Spearman joked.